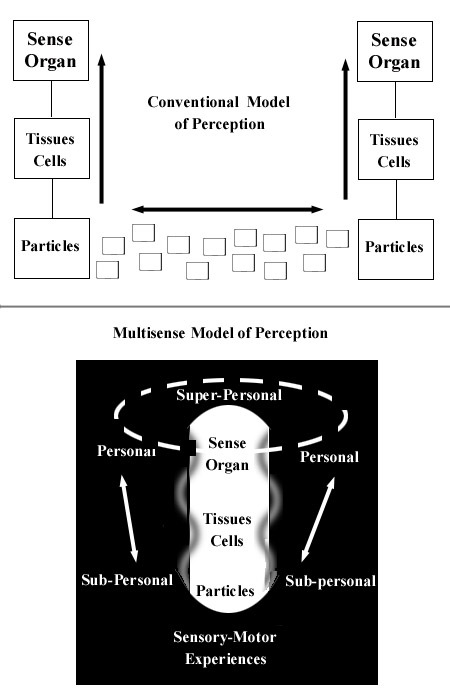 Another crazy looking attempt at organizing the multisense model of perception. The top diagram emphasizes how the contemporary model assumes that all phenomenal interaction is at the particle level, effected via tangible collisions of microcosmic bodies in spacetime. Higher level experiences are imagined to be epiphenomenal abstractions tied to each other through exclusively bottom up logical mechanical functions. In this model, it must be admitted that consciousness can only be a metaphysical layer of unexplained illusion. In the bottom diagram, the dualism of private experience in white on black, and public spacetime realism in black on white gives an idea of the involuted or ‘Ouroboran’ relation between the two aesthetics. The center region depicts the public stack of spatiotemporal scale relations from microcosm to macrocosm (particles<>cells<>tissues<>sense organs/organisms). The Caduceus like split helix implies a loose hierarchical, bidirectional overlap of interlocking forms and functions on different scales and their implicit interaction with the corresponding private experiences on corresponding levels (personal, sub-personal interiorities corresponds to macrocosmic, microcosmic exteriors). The label ‘Sensory-Motor Experiences’ at the base designates that the totality can be understood literally as sensory motor phenomena but the label and dashed halo at the top refers to the figurative capacities for empathy, semiosis, social quorum and teleology. In this model, all layers are phenomenal and physical and consciousness or sense is a fully enfranchised, participant in physics on every level. Interaction is multivalent and multi-directional, bottom up, top down, inside out, outside in, past forward, future back. Just more of the age old Descartes/Russell argument, with a tad of Wittgenstein thrown in for good measure. Did any of them mention a sensory-motor primitive? An involuted monism? A new model of energy, time and entropy? I would say I’m closer to Berkeley and Deleuze from what little I know of any of it. I see resonances with the hylemorphic dualism of Aquinas and Aristotle here with the “super-personal” realm representing the intellectual powers and teleology of the soul which is, in fact, the substantial form of the body (even though the intellect is immaterial). Question: In your view is color something “in” the objects of the world the same way, say, their shape or size is? I think that MSR wants to conceptually bleed together, as much as possible, the modern distinction (prominent since Descartes and Locke) between primary and secondary qualities, no? Good questions, sort of complicated to answer. I haven’t looked into hylomorphism but it has come up a few times so I probably should. I see the personal, sub-personal, and super-personal as loose ranges within the continuum of private physics. I try to keep it as grounded as possible, so that sub-personal just refers to experiences related to parts of us which are smaller, faster, and less significant than we are as individuals in our own estimation. The super-personal, likewise, are those experiences whose influence bleeds into our lives from social, cultural, terrestrial, or extraterrestrial scales. The sub-personal would be more instinctive and reflect biological drives and the super-personal reflects more intuitive and transcendent themes. This does map roughly to the chakra system, the alchemical monochord, Wilber’s Integral states and all of that, but my emphasis is on the physics of that hierarchy, how it is the presentation of microcosmic, macrocomsic, and cosmic time, with the gradual lifting of intention from the instantaneous to the eternal. As far as color goes, MSR begins by inverting the Locke categories so that private qualities are primary and public realism is secondary. Color, therefore, is a more private quality of the experience of an object only because of the nature of color qualia, not because it is inherently private. Characteristics like shape and position are more public only because those qualia are more widely accessible. To get the color qualia that we get, you need a fancy human participant, but to get the experience of an object as a mere obstruction in your path with coherent boundaries, you need only to participate in the universe as a public object.